You won’t want to miss this month’s GARA meeting. Greensboro is blessed to be home to Guilford County Auxcomm (formerly ARES), a great group of people who train, prepare, and stand by to assist with emergency communications at a moment’s notice. 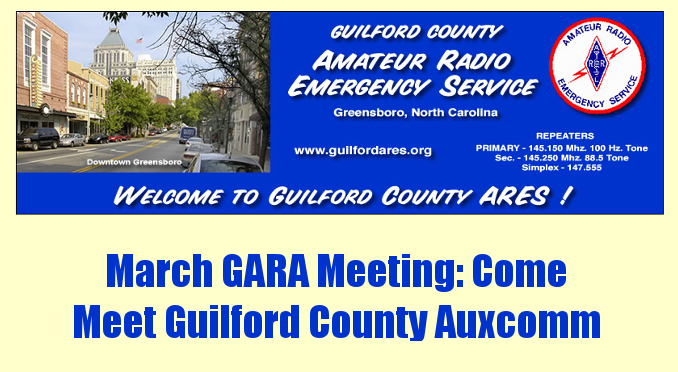 Jim Waynick N4JLW, the Guilford County Emergency Coordinator, will be presenting on Auxcomm activities, preparations, and achievements, and let us know how we can become involved to serve our community in times of need. Be sure to set aside the time to meet at Cooper’s Ale House this coming Monday. No Replies to "March GARA Meeting: Guilford County Auxcomm"